I got hit square in the the nuts by a tomato. I was so busy guarding my face I didn’t even think to guard my most treasured anatomical possessions. After that, getting hit the face didn’t seem so bad. However, I didn’t want to cower behind others in fear of being hit by a tomato. 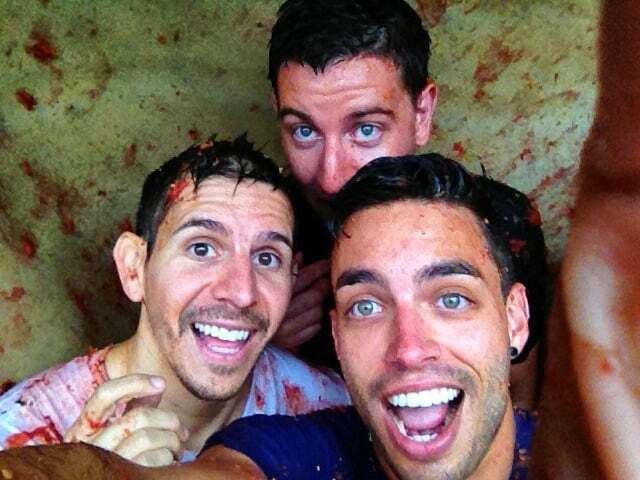 We were at La Tomatina after all, one of Spain’s most ridiculous festivals involving an extreme tomato fight . One way or another, we were going to get hit. Still, my husband and our friend Nate who was visiting us from the States still decided that finding human shields would be a good tactic. They chose two extremely tall Australian girls who were around 6’2” to use as cover. How typical that these two gay men would choose two warrior Australian women to hide behind. But if it works, it works. They didn’t get hit in the nuts after all. 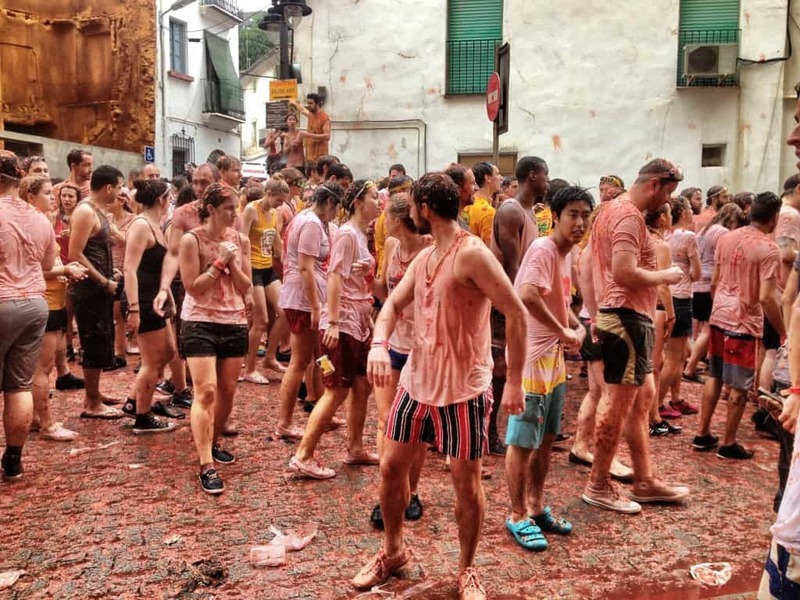 Much like Batalla del Vino, La Tomatina was a festival in SpainI had heard about a while back and was determined to experience. I dragged Auston and Nate along with me to Valencia, Spain where the festival would be held just outside the city in the smaller town of Buñol. It’s located about 30-40 min inland. This year was the first time Buñol was charging an entrance fee for the tomato throwing festival and when purchasing the ticket online for La Tomatina, you can also book your round trip bus ride from Valencia at total price of 30€. That’s 10€ for the festival and 20€ for the bus. Unfortunately we booked this last minute as we do with all of our travels which forced us to take the first bus to Buñol the morning of La Tomatina at 5:30am. That morning was also shrouded in misery as clouds collected above us blocking the sunrise. It was a cold, wet, and dreary day. The rain poured and we took cover as we waited for the festival to commence. With the sound of a gunfire, the tomato throwing began and the rain ceased as if in response. We let go of the morning chill with each tomato we grabbed off the ground (which were launched into the crowds from huge trucks) to throw into the masses. Not particularly aiming at anyone, we jumped into the riot and tried to avoid direct hits. Though it was a rough start to the day and we had to bathe in a puddle of water afterwards to avoid the outrageously long lines to the showers, it was a festival I won’t soon forget. And perhaps one I won’t soon return to. There were very key things we should have done in preparation so I’ll lay them out for you below so you can be more prepared than we were. 1. Bring a change of clothes. You can shower after the event and surely dry off quickly if the sun is out. But if you have our bad luck with the weather, you’re not going to dry in the clouds and you’re not going to want to keep those nasty tomato covered clothes on while you’re sipping sangria and eating paella. We were freezing, soaked and jealous of everyone who had dry clothes. You’ll want to wear close-toed shoes during the tomato fight, but you may want to have sandals to throw on after as well. Definitely bring a poncho if rain is in the forecast! 2. Don’t check your bag. There is a bag check so you don’t have to carry your stuff around with you. But if you want to avoid long lines (they’re really very long), just keep your stuff with you in a backpack that you don’t mind getting tomato’ed. Wrap all your stuff that’s in your bag inside another plastic bag for protection. We brought a standard draw string backpack that was no hassle to carry around. 3. Buy your ticket in advance. They only sell a limited number of tickets. If you’re booking a bus with your ticket, book this in advance as well. You don’t want to have to take the first morning bus otherwise you’ll just end up waiting around Buñol for hours like we did. The city isn’t exactly overflowing with things to do. 4. Wear white clothes that you can toss. It really shows off the tomato juice and you’ll not want to keep them after. Tomatoes can smell surprisingly bad. 5. Wash quickly after it ends. 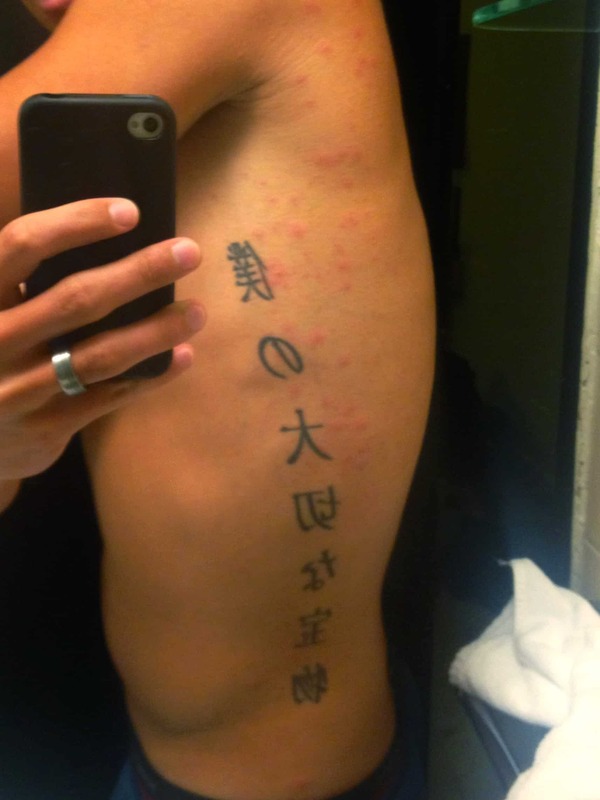 Tomatoes are fairly acidic and can give you a rash for a couple days, especially if you have a mild allergy. Enough paella to feed a tomato throwing army! 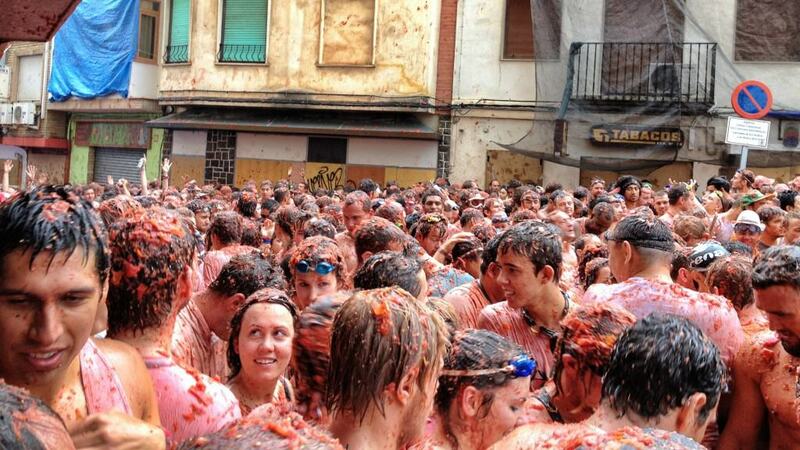 What do you think of La Tomatina? Does it sound like a festival in Spain you’d want to check out? 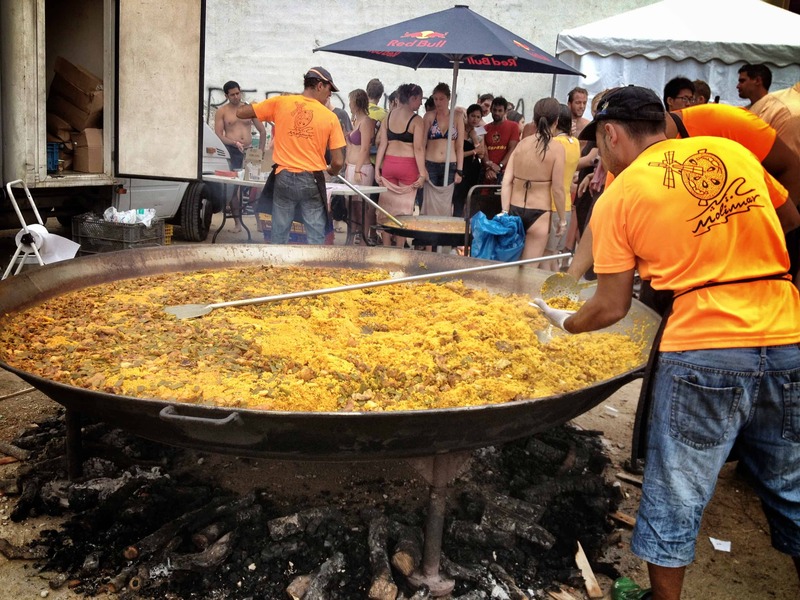 Talk to us for tips on this and other Spanish festivals on Pepo! Yea, the weather really made it hard to enjoy. I’m not a fan of the cold at all. But we sucked it up and had a great time. It’s a once a year event after all! 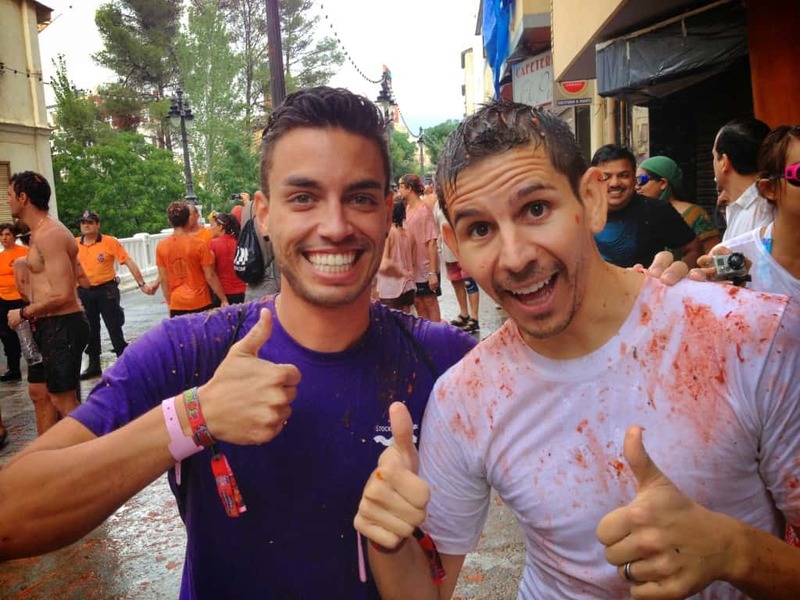 So what do you think about tips for La Tomatina Savi? Have any to add? ?